The time every football fan has dreaded has finally come, and we have to say goodbye to the 2018 FIFA World Cup Russia. What a tournament it has been! We take a look back at the most memorable and meme-worthy moments that will surely go down in footballing history. Russia, being the nation with the lowest-ranked football team to ever host the cup, was quick to set the standard with a 5-0 win against Saudi Arabia in the first match of the tournament. Crown prince of Saudi Arabia Mohammad bin Salam attended the match with FIFA President Gianni Infantino and Russian president Vladimir Putin. "Is this the first meme?" "I think so!" Amazingly, this tournament has the record for the most own-goals scored during a FIFA World Cup (12) and penalties awarded (28). Croatia’s Mario Mandžukić was the first to score an own goal in a WC-final, having seen of England in the semis. The implementation of VAR (Video Assistant Referee) has undoubtedly had an impact on the tournament, but there were still the usual theatrics. And some unrelated magic by Brazilian goalkeeper Allison. Neymar was quick to become a meme favourite, much thanks to his dramatic rolls. It is estimated he spent some 14 minutes on the ground, making him the star of some of the funniest memes (in the history) of the tournament. The young Brazilian still has a long way to go if he ever wants to equal the achievements of Ronaldo and Messi, but his memes at this WC are undoubtedly GOAT (Greatest Of All Time) material. Neymar was not the only player to get “fouled” at the tournament, with Portugal defender Pepe also getting in on the action. As long as there is no VAR watching the supporters sneaking in a drink, these Colombian fans are happy. A major surprise came with the exit of Germany, making it the third consecutive time the defending champions were defeated at the group stage, following Italy in 2010 and Spain in 2014. As for the Senegalese team, they might have taken warm-ups to a whole new level. Who could have predicted such an early departure for both Messi and Ronaldo (... also known as Argentina and Portugal)? Spain's sensational loss made it the first time in history that Russia advanced through to the quarterfinals, beating Saudi Arabia and Salah.. Egypt on the way. Some have even argued it might have been part of a prophecy, finding Akinfeev’s game-winning save over Spain on a cash note. Russia’s quarter-final loss on penalties to Croatia was surely sad for the millions of home fans following the tournament, but the team’s performance was anything but disappointing. This might just be the most iconic celebration at the 2018 World Cup. Some argue the Russian team’s performance was largely helped by an amazing home crowd. We witnessed England finally winning a penalty shootout, having not managed to do so since their win over Spain in Euro 1996. It all ended with a loss to Croatia in the Semi-Final, putting a final stop (at least for now) to the “It’s coming home” memes across the internet. Speaking of popular memes during the World Cup, Maradona was sure to make headlines with his ecstatic celebrations. The Croatian fans on their side, might have won as many hearts as their team playing on the pitch. 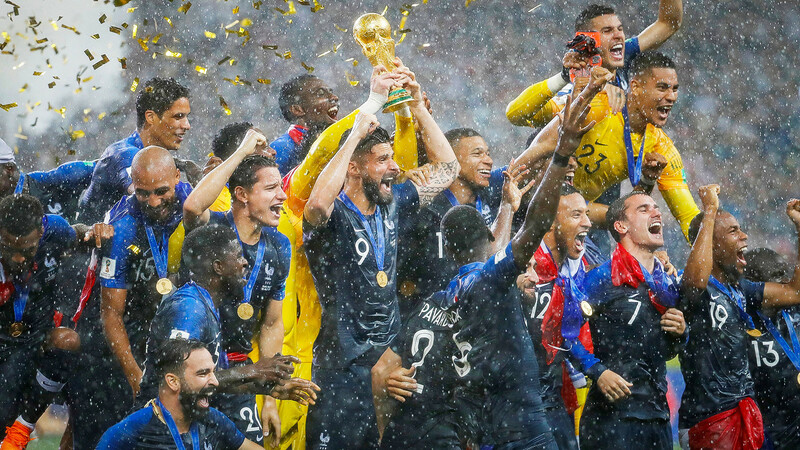 In the end, the best team won, and all our congratulations go to France for serving us with some world class football. Especially 19-year old Mbappe, becoming the first teenager to score in a WC-final since Pele. … and then there is only one thing left to say, World Cup Russia, we will miss you!